Helium was the last gas to be liquefied on account of having lowest critical temperature -268 C of all known gases. A peculiar property arising in the Helium system is that solid cannot be obtained merely by lowering the temperature of the liquid. Kamerlingh Onnes failed to solidify Helium despite the fact that he has reached a temperature of 0.84K. Solid Helium was first obtained by "Keesom" who subjected liquid Helium to very high pressures. The solid is obtained at a pressure of 250 atm at 4.2K while it soldifies at only 23 atm at 1.1K. Thus it is necessary to increase the pressure simultaneously while lowering the temperature of liquid. Later investigations revealed that at high enough pressure, solid Helium could be obtained in equilibrium with the vapor at temperatures well above the critical point of gas. Thus at 5800 atm, solid Helium is obtained at a temperature as high as 42K. This is the curious property of Helium system that although liquid cannot exist above the critical temperature(5.2K), solid can exist if sufficiently great pressure is applied. Hence at high enough pressure, the melting pressure, the melting point exceeds the critical temperature and solid Helium melts to form gas. The phase equilibria of Helium are represented diagrametically in Fig. Phase diagram shows that it is entirely different from that of all other substances. The fusion curve(or solid liquid phase line) and the saturated vapor pressure curve (or liquid vapor phase line) do not meet in a point, as in case of other substances and if we pursue the vapor pressure curve down to lower temperature it is found that the vapour and the liquid continue to be in equilibrium down to the absolute zero. Thus the 3 phases solid, liquid and vapor are never found to coexist or in otherwords, Helium has no triple point in conventional sense. The helium will not solidify even at 0K if it is not subjected to pressures exceeding 25 atmospheres. 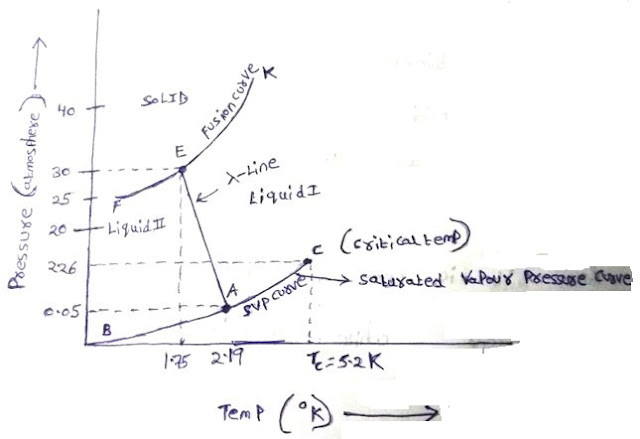 The SVP curve on the other hand, appears to proceed normally to the left towardsthe Origin(P=0, T=0) but to the right it terminates at critical point corresponding to a temperature of 5.2K and a pressure of 2.26 atmospheres. The point A(2.19K) is known as the Lambda point of liquid Helium under its own pressure. This transition divides the liquid state into two phases, Helium I and Helium II. The fusion curve and SVP curve are joined by the Lambda line running between the points 'E'(T=1.75K, P=30atm) and A(T=2.19K and P=0.05atm) with Helium-I to its right and Helium-II to the left. Thus, Helium is present in the liquid form on either side of Lambda line. Kamerlingh Onnes, in course of his investigations found that liquid Helium shows an extremely interesting behavior if it is cooled below its boiling point (4.2K) to about 2.18K, he found that the density passes through an abrupt maximum at 2.19K decreasing slightly there after as shown in Fig. 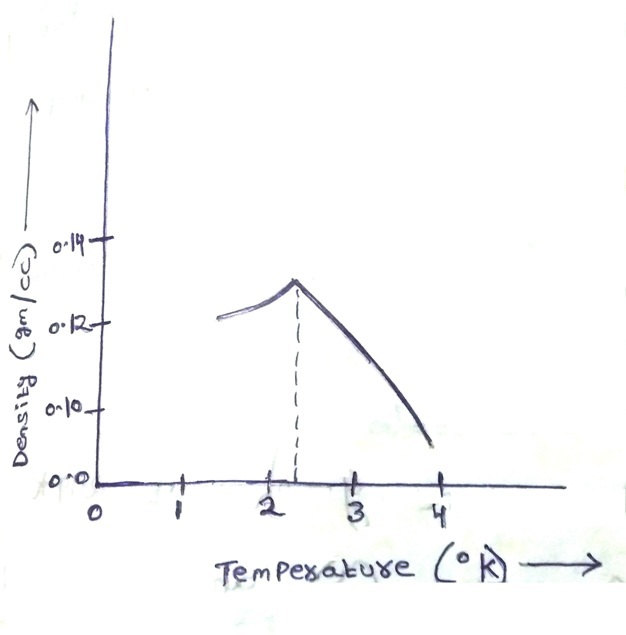 The density first rise with fall of temperature from 4.2K up to 2.19K reaches a maximum value 0.1262 at 2.19K and then decreases with the decrease of temperature. Thus below 2.19K, the liquid Helium which was contracting when cooled now begins to expand. Cv increases upto 2.19K and at this temperature there is a sudden an abnormal increases in its value. Beyond 2.19K the specific heat first decreases and then increases. 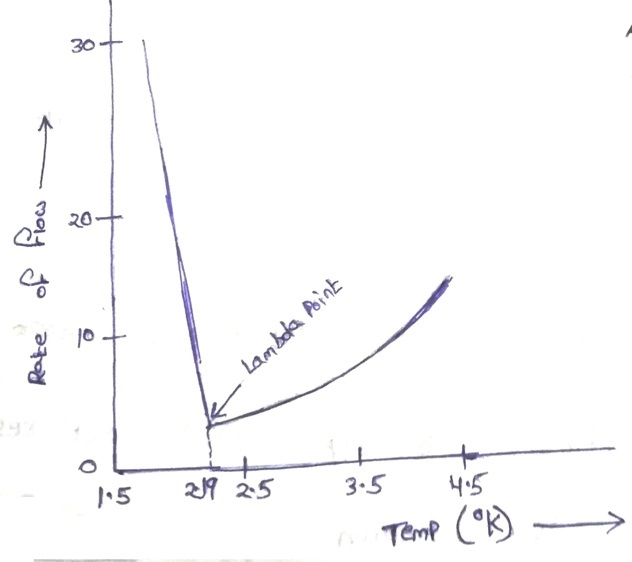 The Specific Heat temperature graph at 2.19K looks like the Greek letter Lambda and hence this temperature at which specific heat changes abruptly is called Lambda point. Liquid Helium above 2.19K which behaves in a normal way is called liquid Helium-I. Liquid Helium below 2.19K is called liquid Helium-II because of its abnormal properties. a) The entropy is continuous across the curve i.e. The entropy of He-II is same as that of He-I. 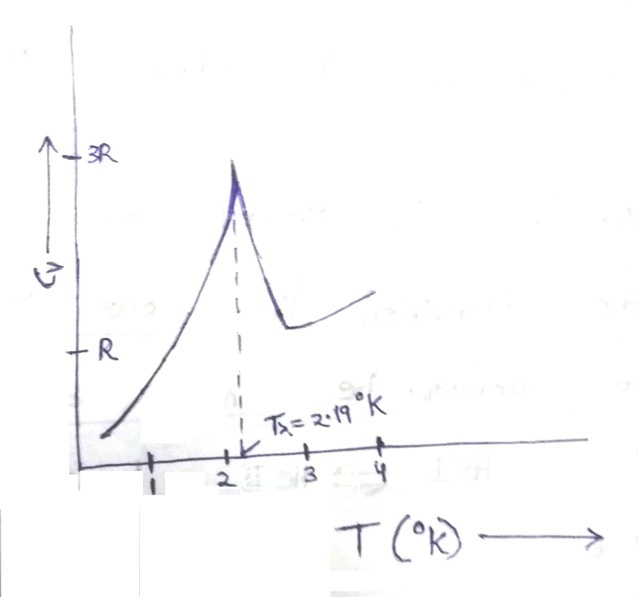 b) There is no change of density during transitions i.e. density of both types of liquid is about same. while the viscosity of liquid increases with decrease in temperature, that of liquid He-I decreases showing He-I resembles a gas. The viscosity of He-II is almost zero. At Lambda Point, the rate of flow increases abruptly and below it, the flow is found to be extraordinary large thus proving experimental evidence of a very low viscosity of liquid He-II. The values of viscosity coefficient plotted as obtained by oscillating disc method. There is a sharp discontinuity at Lambda point. The viscosity falls by a factor of about ten on passing through the lambda point. Kapitza found that Ratio of Viscosity of HeliumII to HeliumI is approximately 10^-3. Thus liquid He-II has practically zero viscosity and can flow rapidly with out resistance. This property is known as Super fluidity. Helium-II is found to have an extraordinary high coefficient of thermal conductivity. The heat transported per unit temperature gradient is several 10 times as great as that in copper at room temperature. He-II is said to be about 800 times more conducting than copper. 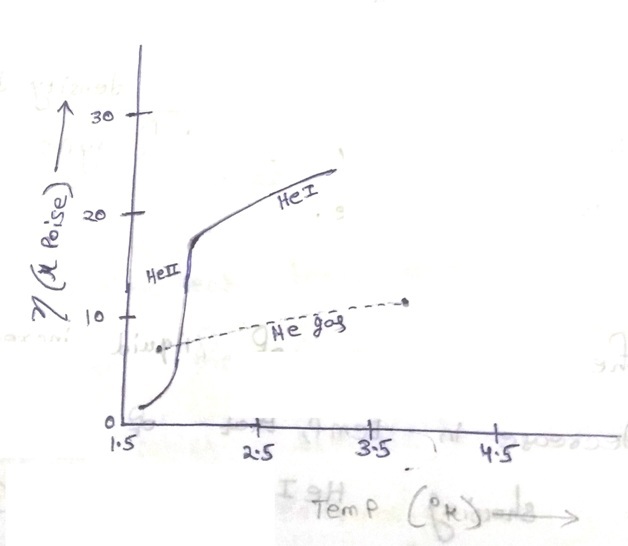 It is found that heat flow in He-II is not proportional to temperature gradient. Daunt and mendelsohn pointed out phenomenon of superconductivity in He-II. Liquid He-II can creep along solid surfaces in the form of high mobile film generally known as "Rollin" (also called as Rollinsimon) film. The properties of film were investigated by Daunt and Mendelsohn. a) If liquid level inside tube is less, flow of liquid takes place from bath to tube. b) Flow from tube to bath. c) Liquid inside the tube creeps out along surface of tube collects at its bottom in form of drops and falls into bath till tube becomes empty. Thus liquid He-II seems to defy gravity by creeping out of containing vessel by coating the walls with a thin film of the liquid.